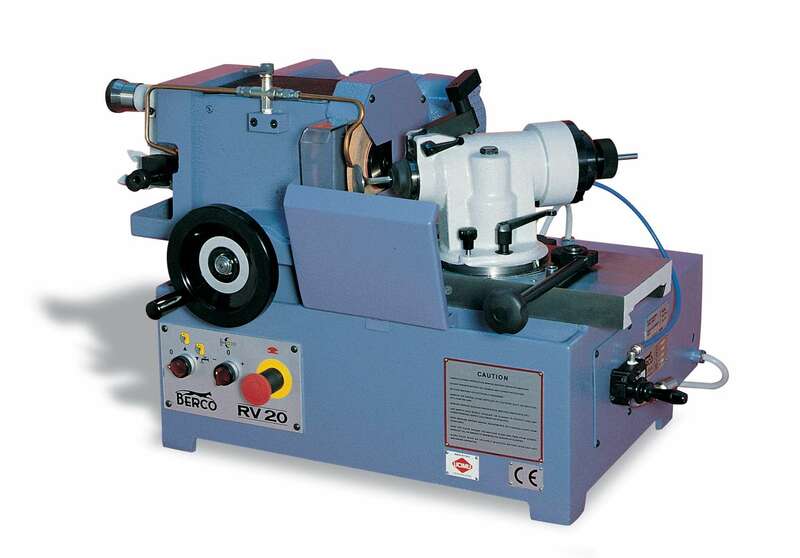 The Berco RV20P is a dedicated high precision machine for refacing automotive valve seating angles and stem tips as well as having a rocker grinding facility. The machine has two main components mounted on a common base. The main grinding wheel is mounted on a slide way which allows movement of the wheel towards the mounted valve. The valve to be machined is fitted into a pneumatic collet chuck which is fitted to an angularly adjustable base. 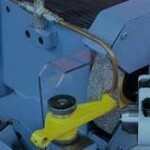 This in turn is also mounted on a slide way to allow movement of the valve angle across the face of the grinding wheel. The angle valve face to be machined is set by moving the angularly adjustable chuck on its base before locking it in this position. During operation the grinding wheel is cooled by oil to ensure no overheating occurs which might distort the valve being machined. This also ensures that the finished result is of a very high surface quality. 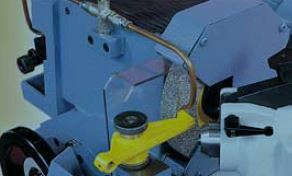 A secondary grinding wheel is mounted at theopposite end of the shaft driving the main wheel. This is used in conjunction with a “V” block attachment which can be used to reface the valve stem tips. A micrometer wheel is incorporated in this attachment which in turn allows very accurate removal of material when machining valve lengths to accommodate instances where valve length is critical. The pneumatic valve holding chuck is equipped with various interchangeable collets allowing valves diameters ranging from 4.5 to 15mm to be machined. The collet chuck ensures total concentricity, accuracy and repeatability when machining the valve face angles. The additional rocker grinding attachment permits the refacing of conventional rocker arms found in OHV type engines.